If you continue to have problems or need help with a step, our customer service representatives will be happy to help you! Please find your Order ID or locate a copy of your purchase receipt before contacting Customer Service. This will greatly speed up our response time. Everyone’s ear canals are different. As such, we understand that any earbuds will vary in their effectiveness across the board, especially when it comes to getting a waterproof seal. We designed HydroActives with this in mind. If you are swimming laps, make sure you are using the earbuds designed for submersion. The tree tips for the HydroActive Headphones were designed to function like earplugs to keep your ear free of the water that would distort and muffle the sound. Insert them the same way as ear plugs. 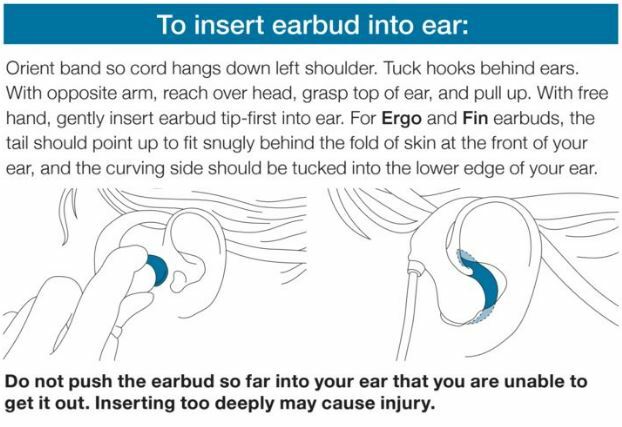 To do this, if you were to insert into the right ear, use your left hand and reach over your head and grab the top of your right ear. Gently pull toward the ceiling. This will open up the ear canal so that you can directly insert the earbud. When it is in let go of your ear with your left hand. This allows the ear canal to close over the ear bud and keep a good fit and sound. This video shows how to use and insert each of the four different types of buds that come with the HydroActive Headphones along with tips on how to work with the wraparound band. Check out helpful tips and instructions addressing these problems on our website here!